In the final days of September, 1974, 314 boxes of Pinot Noir were picked with a sugar-acid balance beautifully characteristic of Mount Eden grapes. The fruit was abundant in sugar at 24.7° Brix, and uniquely, the total acidity was maintained at 0.84%. The grapes were crushed directly into stainless steel, jacketed tanks, and fermented on the stems. This stage was complete and the juice dry in eleven days. The wine was racked once in December, and twice again before bottling. A fining with fresh egg whites was performed in June 1976. This, together with twenty months of barrel aging in Nevers Oak, mellowed the wine gently. 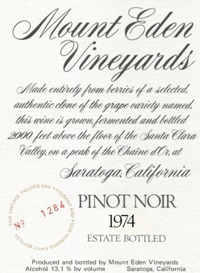 The Pinot Noir has a delightfully peppery nose, and bold richness making it more exuberant than the delicate 1973 vintage. It has an excellent aging potential, and can be shared proudly for years to come. Sorry, technical notes are not available for this vintage.